Want to reduce the amount of cooking grease in your local Waste Water System? 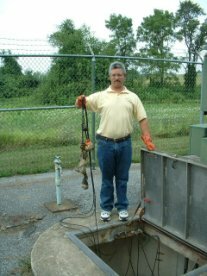 Eric Harbaugh with the Guilford Township Authority found a great solution to grease-clogged pumping stations and at the same time received an incredible "PR" boost. Our Trap The Grease campaign was a great maintenance and PR move for our Waste Water Collection System. We have offered a FREE Fat Trapper made by Range Kleen to each of our customers. This encouraged these customers to pour their excess cooking grease into the Fat Trapper instead of down their drains. They also felt great after receiving something for FREE after paying their bill. It's a dirt cheap way to help eliminate one of the main causes of your overflow problems. The Fat Trapper is a plastic, airtight container that holds a foil lined bag. Simply pour hot cooking grease into the bag, seal, and replace the lid. It eliminates spills and odors, while protecting your residents' plumbing system. When the bag is full, simply remove, seal, and discard. More Questions? Contact Jackie Schroeder (jackie@rangekleen.com) or any Range Kleen sales team member toll free at 888.391.2020. As you know, grease blockages in sewer pipes are a direct result of grease that is poured down the drain. 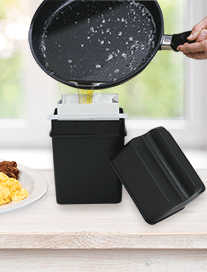 The Fat Trapper is the answer to proper disposal of unwanted cooking grease and is already in use by various Waste Water Departments around the nation to help them "Trap the Grease."